Day by day, we are coming to learn who these Manly Man are. We're talking cowboy men, swinging from vines Tarzan-like men, sweaty firemen-men. Men. As we've learned, these Men dabble in the paleo diet and drink Tecate. It turns out that these men who are Dastardly Handsome, they also eat yogurt. 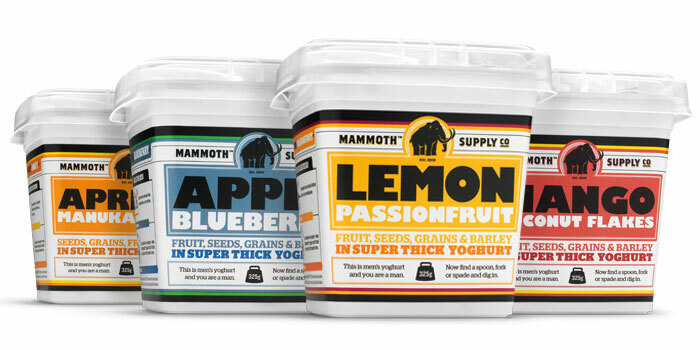 Yogurt that is Dangerously Smooth. Yogurt that is super thick and covered in fruits, seeds, grains and barley. Yogurt that arrives in a hulking tub (with a club?) to fend off hunger. 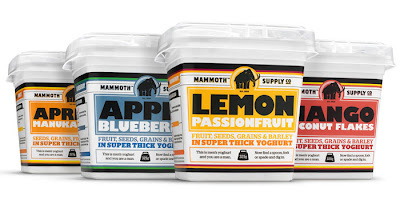 If you are looking to attract just this type of man, you may want to fly down to Aukland, New Zealand (where we imagine Men are everywhere) to pick up a few tubs of yogurt from The Mammoth Supply Co.
love this - those ads are hilarious! where do you ladies find such great stuff? ?